I’ve been a Dermablend girl for years; I had found something that worked, and I never looked back… until now. As part of my job at DressTech, I have the opportunity to try many great products. This week, I compared full coverage foundation from Dermablend, Mehron, Ben Nye and Kryolan. What does full-coverage mean anyway? Coverage refers to the the level of opacity and pigmentation. “Sheer” has the least coverage, followed by “light”, “medium” and “full”. Full coverage foundation may contain up to 35% pigment which is exactly what we need for heavy-duty applications, such as covering beard shadow. How did they perform? All of the foundations performed similarly in terms of coverage; I was hard-pressed to find much difference in opacity. That’s not surprising because all of the brands pretty much rely on the same basic minerals for pigmentation. Indeed, the most obvious differences were found in packaging and consistency; how hard or how creamy. After considering these factors, the Mehron CreamBlend stick nudged out an overall win. As the name implies, the Mehron CreamBlend Stick is indeed creamy. It promptly melts to a creamy consistency and blends rather easily. In fact, I was able to use CreamBlend on my entire face, applying a full coverage over my beard shadow and blending to a lighter coverage on the remainder of my face. In contrast, it was necessary to vigorously rub my formerly “go-to” DermaBlend, just to reach a workable state. Then, although DermaBlend did effectively cover my beard shadow, it made other areas look cakey. 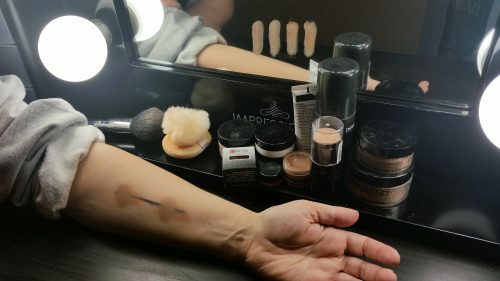 I’m also a new fan of stick packaging, which allows me to quickly apply my “war paint” with a few quick wipes, and then blend away with my fingers or sponge. Transferring DermaBlend to my face required my fingers to make countless trips to a little jar. Overall, I preferred the creamy consistency and blending of the Mehron CreamBlend Stick. The stick packaging won additional points for speed and convenience. After all of these years, I now consider myself a Mehron girl. I agree. Mehron (light aususte) is the first thing to go on my face after a close shave. For me it lasts all day and I feel the stubble before I see it. Somehow the twist-up container broke and I could not extend the stick, nor find quick replacement. It’s so valuable to me I ended up melting the product and transferring into a flat makeup jar for sponge application. Less than an ounce lasts for dozens of transformations and I never leave home without it! Great information thank you! I’ve been a devoted Dermablend user since my first inquiry 2 years ago at Sephora as how best to hide dark beard. The Dermablend full coverage does exactly what it’s supposed to do, but I agree it can look very cakey elsewhere… Definitely going to try out the Mehron. I love the idea of the stick packaging also, so much more convenient!